Romantic, sporty or classic? We make the choice easier – these styles from the 03/2019 issue of BurdaStyle magazine include the perfect blouses for every occasion, style and figure. Topstitched and beaded flounces give this style with its sporty striped shirting fabric a breezy and fresh touch. The look is especially flattering for women with smaller bustlines. The flared sleeves look great while also adding a bit of comfortable coverage for the first warmer days of the season. The half-length sleeves are an easy and comfortable choice for the fluctuating temperatures of the season. The sporty blouse includes a V-neckline and rather than structured panel seams, it has a tying belt – so you can choose to draw it close or let it drape more casually. This style is an update on the business blouse. We kept the classic features like the button placket, turndown collar and a back yoke, then refreshed it with cropped sleeves that draw in the extra volume thanks to deep pleats at the cuff. A sophisticated and fresh look. The perfect choice for even those that find blouses to be too “stuffy”. This style in a fine silk does away with superfluous details and lets itself get the highlight from sophisticated gathering along the panel seams. Prints are very effective when sewn into this straight-line shaped blouse. The gathers add extra swing to the pattern and the hem gathers at the sleeve ends are ideal for border prints. Whether time at the office or a dinner is on the agenda this ultra-feminine wrap blouse with the wide hem band and ties that cap the deeply set sleeves is one that works for (almost) every excursion. Knotted blouses are having a revival this season. They are a great choice to pair over close-fitting tops or dresses for an effortless fashion bridge of looking great and casual cool. This pretty blouse in the popular paisley print is sure to quickly become a wardrobe favorite. Style it with jeans or with fine trousers to look great either way. The tying bands are secured into the side seams to let you adjust it to your figure. 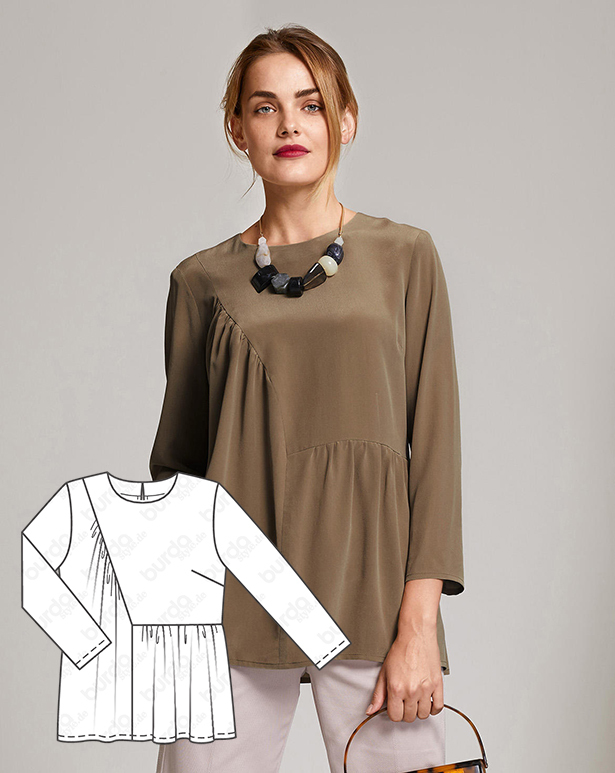 Sew up ALL these fabulous blouses with the discounted pattern collection bundle here!